Patients suffering from blepharitis often find it very unpleasant to have a look at the mirror. The disease is usually accompanied by severe reddening of the eye, adherence of eyelids and secretion incrustation at the eyelids. Certain environmental factors are often the cause for this. Thus, external stimuli like dry air, dust or smoke can trigger inflammations at the edges of the eyelids and the conjunctiva. Apart from careful hygiene of the edges of the eyelids, disinfectants have proven useful in therapy. When secretion accumulates around the glands at the edge of the eyelid, it creates excellent conditions of growth for bacteria. Apart from an effective hygiene, a reliable protection from infection of the mucosa is important in order to prevent pathogens from settling down, as it is the case with hordeolums. The active ingredient bibrocathol contained in Posiformin® 2%, disinfects the irritated edge of the eyelid and the surrounding conjunctiva. At the same time, bibrocathol creates an effective barrier against intruding bacteria and thus provides a basis for a quick remission of the affliction without any complications. The active ingredient in Posiformin® 2%, eye ointment is not absorbed by the mucosa of the eyelids and the conjunctiva. Therefore, Posiformin® 2%, eye ointment only exerts its effect at the location of the inflammation. This also has another advantage: The active agent bibrocathol will not be absorbed into the blood circulation. This prevents the occurrence of systemic side effects, which allows for a safe and well-tolerated therapy. Preservatives, which are often contained in eye preparations, affect the ocular surface in a variety of ways. Apart from detrimental change of the tear film, these substances can directly damage the cells on the surface of the cornea and the conjunctiva. The toxic effects of preservatives can already be verified minutes after the application. Posiformin® 2%, eye ointment is entirely preservative-free. This clears the way for an unimpeded recovery of the inflamed tissue of the conjunctiva and the eyelids. 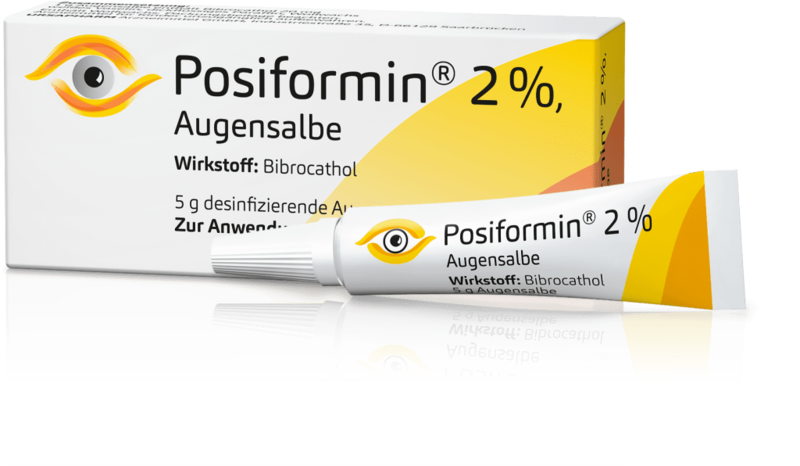 Posiformin® 2%, eye ointment – your strong partner for the therapy of blepharitis and conjunctivitis! 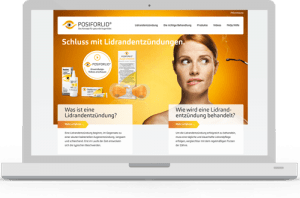 Posiformin® 2%, eye ointment. Active ingredient: Bibrocathol. Therapeutic indications: Irritiation of the outer eye that are not caused by bacteria, chronic (long lasting) inflammation of the eye lid margin that are not caused by bacteria and non-infectious fresh wounds of the cornea. For risks and side effects read the package leaflet and ask your doctor or pharmacist.